Arrabiaa switched to Nilesat 201 satellite at 11900.00MHz, pol.V (DVB-S , 11900.00MHz, pol.V SR:27500 FEC:5/6 PID:1305/1306 Arabic). New frequency for Arrabiaa: 11476.00MHz, pol.V (DVB-S SR:27500 FEC:3/4 SID:4 PID:401/402 Arabic- Clear). New frequency for Arrabiaa: 11727.00MHz, pol.H (DVB-S SR:27500 FEC:5/6 SID:5507 PID:5518/5519 Arabic- Clear). New frequency for Arrabiaa: 11900.00MHz, pol.V (DVB-S SR:27500 FEC:5/6 SID:1603 PID:1305/1306 Arabic- Clear). New frequency for Arrabiaa: 12467.00MHz, pol.H (DVB-S SR:27500 FEC:3/4 SID:3713 PID:1028/1029 Arabic- Clear). Arrabiaa is back on 11564.49MHz, pol.H SR:27500 FEC:5/6 SID:6207 after a break ( PID:5518/5519 Arabic - Clear). New frequency for Arrabiaa: 11564.49MHz, pol.H (DVB-S SR:27500 FEC:5/6 SID:6207 PID:5518/5519 Arabic- Clear). New frequency for Arrabiaa: 10719.18MHz, pol.V (DVB-S SR:27500 FEC:3/4 SID:3912 PID:3936/3937 Arabic- Clear). New frequency for Arrabiaa: 11564.49MHz, pol.H (DVB-S SR:27500 FEC:3/4 SID:6207 PID:5518/5519 Arabic- Clear). A new channel has started in DVB-S Clear: Arrabiaa (Morocco) on 12682.00MHz, pol.V SR:27500 FEC:3/4 SID:40 PID:4001/4002 Arabic. New FEC for Arrabiaa on 11727.00MHz, pol.H: FEC:5/6 ( SR:27500 SID:5507 PID:5518/5519 Arabic - Clear). A new channel has started in DVB-S2 Clear: Arrabiaa (Morocco) on 11477.00MHz, pol.H SR:15707 FEC:3/4 SID:163 PID:2609/2610 Arabic. New frequency for Arrabiaa: 11727.00MHz, pol.H (DVB-S SR:27500 FEC:3/4 SID:5507 PID:5518/5519 Arabic- Clear). New frequency for Arrabiaa: 11977.00MHz, pol.V (DVB-S SR:27500 FEC:3/4 SID:8 PID:5136/5137 Arabic French- Clear). New FEC for Arrabiaa on 11919.00MHz, pol.H: FEC:5/6 ( SR:27500 SID:2513 PID:1113/1114 Arabic - Clear). New frequency for Arrabiaa: 11766.00MHz, pol.H (DVB-S SR:27500 FEC:3/4 SID:6 PID:1660/1620 Arabic- Clear). A new channel has started in DVB-S Clear: Arrabiaa (Morocco) on 11919.00MHz, pol.H SR:27500 FEC:3/4 SID:2513 PID:1113/1114 Arabic. 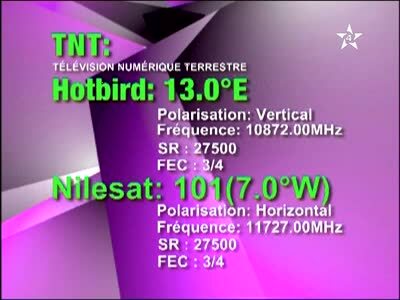 Arrabiaa switched to Hot Bird 13C satellite at 12673.00MHz, pol.V (DVB-S , 12673.00MHz, pol.V SR:27500 FEC:3/4 PID:46/47 Arabic French). New frequency for Arrabiaa: 10873.00MHz, pol.V (DVB-S SR:27500 FEC:3/4 SID:4 PID:46/47 Arabic French- Clear). New PID for Arrabiaa: PID:46/47 French Arabic,48 SID:4 (12673.00MHz, pol.V SR:27500 FEC:3/4 - Clear). New PID for Arrabiaa: PID:47/48 Arabic SID:4 (12673.00MHz, pol.V SR:27500 FEC:3/4 - Clear). New PID for Arrabiaa: PID:46/47 Arabic SID:4 (12673.00MHz, pol.V SR:27500 FEC:3/4 - Clear). Arrabiaa is back on 12673.00MHz, pol.V SR:27500 FEC:3/4 SID:4 after a break ( PID:47/48 Arabic - Clear). New PID for Arrabiaa: PID:51/52 Arabic SID:4204 (12673.00MHz, pol.V SR:27500 FEC:3/4 - Clear). New frequency for Arrabiaa: 12673.00MHz, pol.V (DVB-S SR:27500 FEC:3/4 SID:4204 PID:46/47 Arabic- Clear). New SID for Arrabiaa on 11010.00MHz, pol.V FEC:2/3 SR:13021: SID:4 ( PID:1026/1027 Arabic - Clear). Arrabiaa (Morocco) broadcasts in DVB-S Clear on 11010.00MHz, pol.V SR:13021 FEC:2/3 SID:65 PID:1025/1026 Arabic. Arrabiaa (Morocco) broadcasts in DVB-S Clear on 12149.00MHz, pol.V SR:27500 FEC:3/4 SID:7221 PID:176/177 Arabic.